In 2005, Gina Welch put on ugly buckled loafers and a loose purple sweater and joined Thomas Road Baptist Church. She also grew out her short hair, gained some weight (her "temporary church body"), and replaced her gold nail polish with "good girl pink." The dowdiness was strategic: she was trying to look evangelical. Welch, a self-described secular Jew, had moved to Virginia for graduate school a couple of years earlier. The relocation was a shock. Suddenly she realized that a Berkeley childhood and four years at Yale had given her a slightly skewed perspective on the American religious landscape. Evangelicalism wasn't a weird local aberration after all; secular America was actually "limited real estate on the vast territory controlled by Christians." She decided to investigate that vast territory as an insider. "I wanted to know what my evangelical neighbors were like as people …. I wanted to try to take them on their own terms," she writes. "I felt I needed to go unnoticed if I was going to get an authentic understanding." So she went to Thomas Road, pretending to be a new convert, and spent nearly a year living as an undercover atheist. Unbelieving, she was baptized. (The water was cold, and her mascara ran.) Unbelieving, she took the Lord's Supper. ("I was hungry. Is it wrong to think of this as a refreshment?") Unbelieving, she went on a mission trip to Alaska and led a little girl through the sinner's prayer. That's a lot of effort, but Welch was driven by a sense of mission, determined to break through the stereotypes and explain to the world that evangelicals aren't really all that scary after all. In the Land of Believers, the story of the months she spent as a member of Thomas Road, is her manifesto. If we don't love Evangelicals, if we don't make an effort to understand and accept them, to eat the fish even as it wriggles in our hands, we'll always be each other's nemeses. We'll always be trying to drown each other out. Threaten them, ridicule them, celebrate their humiliation, and you create a toxic dump, fertile ground for a ferocious adversary to rise, again and again. But listen to them, include them in the public conversation, understand the sentiments behind their convictions, and you invent the possibility of kinship. Apart from the creepy and inexplicable metaphor, this sounds good—until you realize that "understand the sentiments behind their convictions" is exactly what Welch means. She may claim to be portraying the evangelical mind, but her entire narrative is marked by a determined refusal to comprehend that there is one. "[H]ow was I to find a place among people indifferent to facts? ", Welch writes in her introduction. It is an opinion that never shifts a millimeter. Listening to Jerry Falwell preach about the offense of the cross, she muses: "By embracing the inscrutable cross, Christians were comfortable not fully comprehending the concepts around which they built their lives." Christian beliefs bypass the brain altogether; the whole notion of the Trinity, she remarks, "reminded me of nothing more than Dracula's ability to transmute into a bat or mist." She is tone-deaf to conviction, unable to comprehend that doctrine has anything to do with the behavior of the people she claims to love. I expected to discover the sociological underpinnnings for evangelical wackiness. I never imagined that I would feel a kind of belonging. Because beyond basically appreciating my friends as fellow human beings, I finally understood what it felt like to believe you knew something that had the power to improve the lives of others. You felt compelled to share it. And whose fault was their ignorance? It was hard to blame them entirely. The answer to the rhetorical question is, apparently, the South. In Welch's world, Christians have "violently side-parted" hair, buckle their belts under ponderous bellies, think airplane travel is exotic, and leave lousy tips. "Could I be a Christian woman to a Christian man? ", she wonders, considering what it would be like to be a real evangelical instead of the undercover atheist variety. "Could I hold his hand and my zipper-bagged Bible as we hurried into church together? Could I look at him across a basket of bottomless fries and be content?" The answer, predictably, is no. "I preferred analysis, reason, and the satisfying realism of hard truths," she concludes, heading back towards her secular life. But she's fairly sure that, one day, her evangelical friends will wipe the grease off their fingers and follow her. Chronicling a heated discussion about the emergent church among her Thomas Road friends, she predicts that resistance to the movement will inevitably crumble in time: "The emerging church was the future for born-agains, as it acknowledged that Christians needed to mold to the shape of the world--not the other way around. Signs of hope were everywhere." That's a staggeringly stupid thing for anyone who claims to understand evangelicalism to write, but Welch is unable to believe that people she likes could really hold well-thought-out, strongly held beliefs that she finds repellent. ("If somehow Evangelicals were forced to co-exist with gay people," she suggests brightly, "Evangelicals would eventually learn that their ideas about gayness were wrong.") 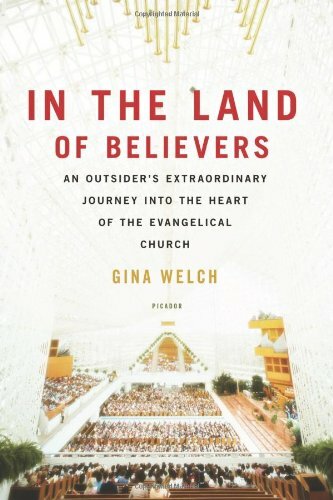 Ultimately, Welch is able to love evangelicals because she finds their identity in their culture, which spares her from having to cope with stubborn things like belief. At the end of In the Land of Believers, Welch quotes a commencement address by David Foster Wallace, in which Wallace recommends that his listeners cultivate peace with others by choosing to see "the mystical oneness of all things deep down …. Not that the mystical stuff is true. The only thing that's capital-T true is that you get to decide how you're gonna try to see it." This, Welch explains, became "the basis of my love for Evangelicals: I was going to choose to see the mystical oneness. And once I started to see it that way, loving them wasn't very hard to do." Loving them while grappling with the reality of their beliefs might be a little bit harder. Despite its many failings, In the Land of Believers demonstrates just how illusory our peace with the secular world can be. I don't wear my pants too low (in part because I give the bottomless fries a miss) or speak with a banjo twang; I rack up my share of frequent-flyer miles, wear black when I'm in New York, and leave decent tips. In my professional world, I go undercover just as effectively as Welch did at Thomas Road. The people I work with know I'm a Christian, but I don't look blue-collar Virginia. Welch's book reminds me that this probably allows my colleagues to forget about the awkward beliefs I hold. If I spoke of the Trinity, of Christ, of sin and atonement—and if they listened—I suspect that the result would not be love and mystical acceptance. It would be appalled surprise, followed by rapid retreat. Susan Wise Bauer is the author most recently of The History of the Medieval World: From the Conversion of Constantine to the First Crusade(Norton), the second installment in a projected four-volume history of the world.